I’m back! I am doing art again the spell is broken. Lots of pain and anger in the world right now but I am in my happy place. I think in times like these art is an oasis and a healing place. Desperately needed by all of us. Music, Dance, Painting, Art Journaling are healing. If you don’t make art you should enjoy art. Visit a museum, listen to your favorite artist, go to a concert, do all of he above. This weekend I had the pleasure/honor of spending time with Mary Beth and John Shaw of Stencil Girl. I enjoyed this time so much! Such kind and generous people and the talent is amazing. Great fun with them at the Scrapbook Convention. Wendy Vecchi was there and taught us a wonderful way to make alcohol inks out of her archival ink refills and alcohol. Wonderful. I think Mary Beth will be showing this in some of her upcoming posts. 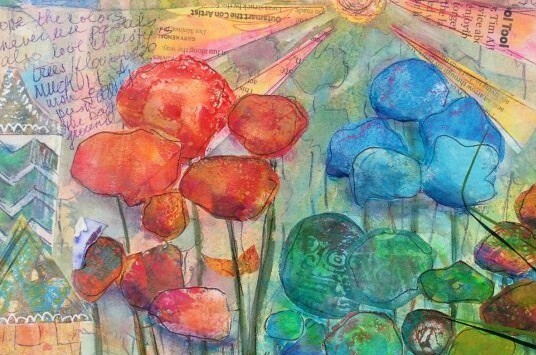 This brings us to Art Journaling Live. What a great event! This is my second year going and I love it. We had 4 instructors teaching different topics. Mary Beth taught Your Brain on Stencils. We used an interesting color palette of burnt sienna, ultramarine blue and a bit of fluorescent orange. A little black and white to lighten and darken and off we went creating a wonderful textured background. My spread is not finished but I have to say I like it a lot. If you know me, I don’t use these colors ever. I don’t even know where my browns are! The orange makes it look lit up. Here is my result and one I did from home. I used teal in my home project. The photos don’t show the depth and texture of the layers. Mine needs to lighten up but still fun. Thanks Judy, it was a great weekend. Sounds wonderful. I love the spread.